The cervical spine is the portion of the spinal column that makes up the neck. According to the University of Southern California (USC) Center for Spinal Surgery, cervical spine fractures are fairly common and, together with cervical spine dislocations, account for around half of all spinal injuries. Cervical spine fracture complications vary, depending on the degree of damage. They can cause symptoms ranging from minor discomfort to life-threatening complications. A person with a minor cervical spine fracture may have discomfort close to the area of injury. According to the USC Center for Spinal Surgery, most people report a great deal of neck pain after a cervical spine fracture. The neck may also be tender to the touch. Cervical spine fractures may also cause neck stiffness due to swelling around the site of injury. 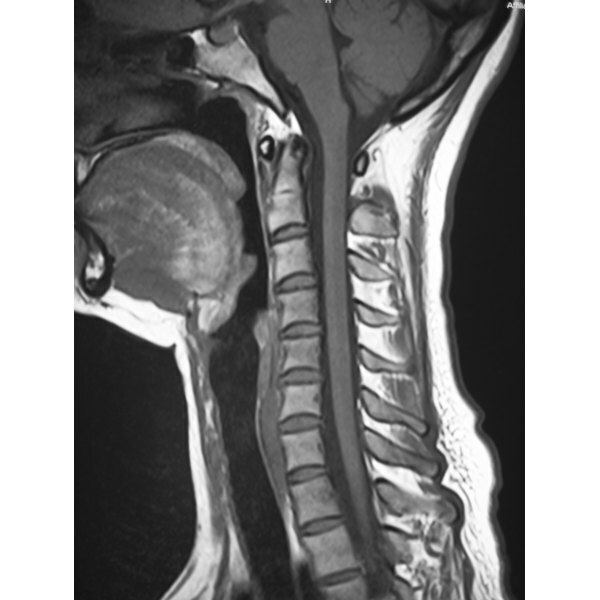 Pain following a cervical spine fracture is not always localized, especially if a nearby nerve is irritated or damaged. Pain may radiate from the neck into the shoulder, down the arm or even into the fingers. The American Association of Neuroscience Nurses (AANN) reports that radiating pain caused by pressure on the cervical nerve roots can range in intensity from a dull ache to an intense burning sensation. Cervical spine fractures closer to the skull can cause breathing difficulties. High cervical spine fractures may interfere with the body’s neurological breathing control center. Following such a fracture, a person may take more shallow breaths and may have trouble controlling his breathing. The neck is designed to move forward, backward and side to side. However, a cervical spine fracture decreases a person’s ability to move her neck in one or more directions. A person with a cervical spine fracture usually has difficulty turning her chin from side to side and may experience pain and muscle spasms when attempting to do so. She may also have trouble tilting her head up or down. A severe cervical spine fracture can cause nerve irritation or damage. If the nerves that control the muscles are disrupted in any way, muscles may feel weaker. In some cases, they may even become partially or completely paralyzed. If the cervical spine fracture affects the nerves leaving the spinal cord, the arms or hands may feel weaker. However, if the fracture affects the nerves in the spinal cord itself, weakness or paralysis may be present anywhere below the level of injury. Spinal fractures that cause damage to sensory nerves may change what a person can feel. Sensory problems following a cervical spine fracture can range anywhere from pins and needles to complete numbness. The areas affected depend on the location of the fracture and the extent of nerve damage. Sensation changes may be present in the shoulder and arms, or may reach down into the legs.